So Brian and I completed our webinar today (thanks for attending!) and we took advantage of the option to customize our questions at the end. 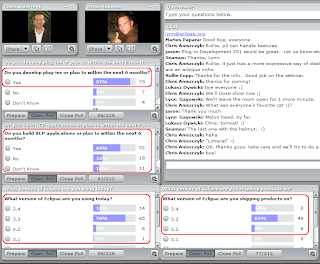 Do you develop plug-ins or plan to within the next 6 months? Do you build RCP applications or plan to within the next 6 months? What version of Eclipse are you using today? What version of Eclipse are you shipping products on? I always had a personal interest in how quickly products adopt new releases of Eclipse. The problem with most products is that they are on different release schedules (ie., 18-24 months) compared to the Eclipse 12 month cycle. The challenge is to decide when to move up and if you decide to skip a release, how do you portray that decision to your customers if they complain they can’t use some cool “Paul Webster” (eg., org.eclipse.ui.menus) feature from the latest Eclipse? I also wonder if the circadian release cycle of Eclipse forces other teams to become a bit more agile when it comes to releasing products instead of being stuck in that crappy 24 month cycle.